Sometimes people call me Slow-mo. Though only certain people… The nickname comes from my speed of doing things. Slow-mo rhymes with Thomo so it is sort of funny. But only sort of. My pace can be frustratingly slow for not only some route climbers who I'd only describe as bright eyed and bushy tailed, but also for myself. When it comes to injuries and their accompanying lessons, I feel incredibly slow, or perhaps a better choice of word is stubborn. I like doing things at my own pace but sometimes, that isn’t an option. It has been over a year and a half now of working alongside an injury that feels like a turtle. Contradicting my own, this turtle goes at his own pace demand all of my patience. It can appear incredible cumbersome; walking as if every step is incredible hard, but then, as if without effort, it moves quickly, surprising me with its progress. My turtle has been a mixture of the two. Speaking of two, it takes two. Yourself being one, working in a disciplined manner, and the other being a physio or like minded healer to help you on the path to recovery. Being pain free allows 100% focus and effort. Ignored injuries can fester into a timely mess, digging a hole thats hard to get out of. My initially injury unignored, may have been three weeks off, yet I chose to ignore the pain, pushing and damaging it further. 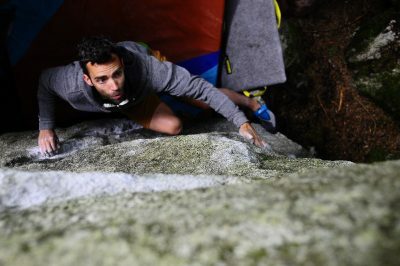 This lack of discipline progressed an injury which ultimately tainted an entire year of climbing until eventually, I succumbed to its reality with a lengthly time off which felt akin to a forced detox. Contrary to my methods, if you listen intently to your body, take the little nags as warnings, and allow them time to heal, a long trip to the bench may be avoided, but only maybe. The crux here is that you have to listen. Listening is hard. When sitting at the base of a climb, voices of temptations pull at you while a sense of invisibility prevails. 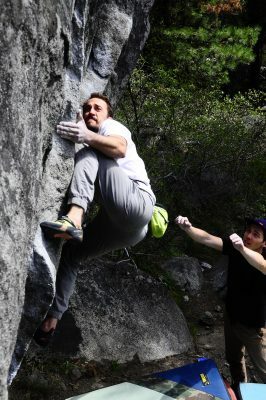 The luring taunts and tricks you into thinking its your last chance to EVER try the problem or route again. Never will the opportunity arise in such conditions. You must ignore all pain and try just One. More. Time. You want it. You’ve never been closer. You promise that if you send on the next try, you’ll take the much needed rest. Listening takes will power. It means taking your shoes off even if the send could be the next try. It means humbling your ego, expectations and desires; taming your sense of invisibility; and not giving into the external pressures from watchful eyes. It means being patient with yourself and respecting the process; trusting that you can and will do it, just not yet... It means letting go of something you want very much, and believing that the rock will still be there when you’re ready, strong, and without pain. Breathing. Trusting. Letting go. Knowing when enough is enough. Trying hard doesn't have to hurt. Balance. Fine line. Full strength. No one is at full strength when they are injured. Alex Puccio knows this. I know this. Set backs will happen especially if pushing oneself to improve. There will be days when the feeling of invisibility and lightness take over making you feel as if wings were on your back. You wake the next day, yearning for it to be like the last, but somehow overnight a bag of coal was dropped into your sack of a body. Not all days are winners. Then, you feel a nudge, a hint that something isn’t quite right. At night you lie awake, listening to it speak through throbs of Morse code in your body. Its subtle but familiar. You’ve done too much. You knew this at the time but it was so fun, it felt impossible to stop. Despite that, you applaud yourself for now heeding its warning. Time for rest and rehab. It’s not easy but you crave the return of what it feels like to move without pain. It might be two days or two weeks, but since you and the turtle are now friends, time doesn’t matter. You understand it’s inevitable return if you don’t heed the warnings. With that, you have the patience and discipline. One step back today, means two steps forward towards climbing pain free. Like what you read? Consider donating! Here is a link to a previous post on injury prevention.